Situated on Roo Island, Dice-a-Roo is a simple dice game of luck. The game is hosted by none other than King Roo himself, who has declared it to be the official game of Roo Island. 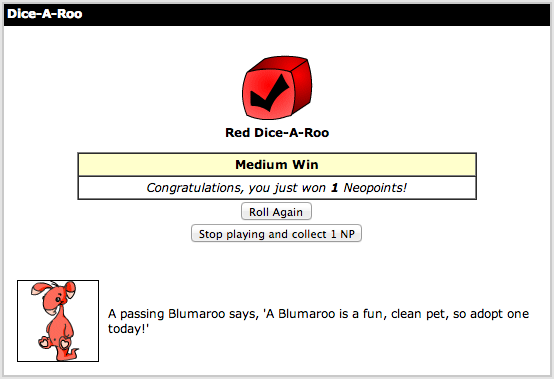 Dice-a-Roo is a very simple game that can have a large return on Neopoints. To begin a new game, click on the "Let's Play" button under the picture of King Roo. Each game costs 5 NP. On the next screen, click the "Play Dice-A-Roo" button and the game will begin. The goal of the game is to advance through all the different dice levels to reach the fifth die. At that stage, you're eligible to win the jackpot. Higher levels give additional prizes, as well as larger amounts of NP. During the game, you have two different options: Roll Again, or Stop Playing and Collect. Clicking the first will continue your current game (at risk of losing your pot if the game ends), while clicking the second will end the game but give you the NP listed. There are five different colored dice, each representing one of the five different levels of the game. The levels go from Red to Blue to Green to Yellow to Silver. Win a select amount of NP for the pot. A chance of advancing to the next level. Nothing happens before you reach the yellow and silver dice. However, on the yellow die you may win a lottery ticket, and on the silver die there is a chance that the Pant Devil will steal an item from your inventory. A chance of having the game end. There is also the mysterious sixth die that passing Blumaroos may mention. It's not actually a die, but rather, the chance of receiving a 10x multiplier when you win the jackpot. Win or lose 1-3 NP per roll. Win or lose 1-8 NP per roll. Win or lose 1-13 NP per roll. There is also a chance that the pot will be cut in half. Win or lose 1-19 NP per roll. Win or lose 1-19 per roll. There is also a chance to win the jackpot. To get the most bang for your buck, never collect the Neopoint pot. It's always more profitable to shoot for winning items and lottery tickets. Eventually, your pets will become bored with the game, requiring you to wait till the next day to continue playing. Usually 50+ games can be played in a single day. Previously Coffee and Marshmallows, Kau Kau Farm Milk, and Neowaiian Bread were available as prizes until their categories were changed on March 18, 2009.